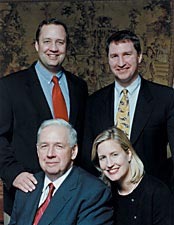 Clockwise from top left: Jim O'Connor Jr., Fred O'Connor, Elizabeth O'Connor, James J. O'Connor Sr.
A family can be defined as a group of people related by blood and history, but it can also refer to a community of individuals who serve a shared goal. In the case of the O'Connors, a family may fit both definitions. Fred, Jim and Elizabeth -- two brothers and a sister -- prove that the spirit of volunteerism remains alive and well. It's a philosophy they learned from their parents, cultivated as students at Kellogg, and brought into their work and after graduation. As Fred O'Connor '86 recalls of his Kellogg days, "when you needed a volunteer, 10 people would raise their hands." This attitude sat well with Fred, who learned about giving to the community at his father's knee. James J. O'Connor was president, CEO and chairman of Commonwealth Edison for 20 years, and despite the demands of his position he found time for community service. Having grown up on Chicago's South Side, James Sr. never forgot neighborhood life, and passed on his love for the city to his children. Today, Fred, Jim and Elizabeth all work for Chicago-based firms. And all three are active volunteers. "Each of us agrees on how to lead a good life, which impacts how to be a good manager," says Fred. "It's leadership by example. A big part of growing up watching my father was learning civic responsibility. Kellogg's community really reinforced that." That civic-mindedness is part of the reason Kellogg is establishing a faculty chair in the name of James O'Connor Sr. Dean Donald Jacobs explains that he and Exelon CEO John Rowe decided that O'Connor merited the honor. "We concluded this would be a wonderful thing to get done for Jim," Jacobs says. "He's helped Kellogg, the Chicago community and people everywhere." Corporations involved in the gift include Ariel Capital Management, Bank One, Chicago Tribune Co., Corning and Unicom. The chair is scheduled for naming and inauguration before summer. Following in his father's footsteps, 38-year-old Fred remains involved with Kellogg and the city. A partner with the consulting firm DiamondCluster International, Fred serves on the Kellogg Alumni Advisory Board as well as on the boards of Chicago Cares Inc. and City Cares of America. Similarly, Elizabeth '98 has drawn inspiration from her father and her mother, Ellen. "I don't know how they do it," she says. "My father leveraged his corporate position to make Chicago a better place and helped causes he felt passionate about. My mom is just as tireless." Elizabeth, 30, as senior manager of corporate development for Tribune Co., develops the company's mergers and acquisitions strategy and worked on its $8.5 billion acquisition of the Times-Mirror Co. Still, she finds time for volunteer work with the Field Associates, the Field Museum's "younger" board, which 34-year-old Jim Jr. '96 started before he and his wife had twins. "I guess I just like starting things," says Jim, a managing director for the internal venture capital fund Motorola Ventures. "I saw an opportunity there that would benefit the museum, and I got a lot of my Kellogg friends to help." Elizabeth has chaired the group's gala ball for the last two years. She's also vice chairman of the Steppenwolf Theatre auxiliary board, and she sits on the Lyric Opera's auxiliary board -- another group that Jim was instrumental in founding. Kellogg has become an extension of the O'Connor family's life. Fred discovered his DiamondCluster opportunity through Kellogg connections; Jim married his Kellogg '96 sweetheart and Elizabeth met her fiancé through a Kellogg friend. "Professionally," Elizabeth says, "Kellogg gave me the confidence to feel I had enough knowledge about every aspect of business not to feel outsmarted by anyone. Personally, I know the friendships I made will last for life."